Sooke's fishing has slowed lately, though there are some nice salmon still to be found out there, for the patient and the skilled (and some luck doesn't hurt). A few chinook salmon in the 30 pound range were reported last week, but most salmon caught were in the teens to mid-20s. 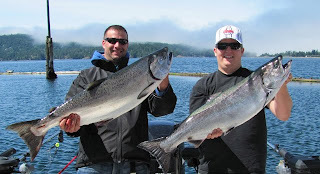 Gord from Foghorn Charters sent in this photos of his guests Rod and Steve with 23lb and 20lb spring salmon. They caught the salmon fishing off the Trap Shack at 55-65 feet, using the new Ryhs-Davis Bullet Roll Heads. There's still halibut around too, as shown by the photo below from Dave H, of a 47 pound halibut caught off Race Rocks, along with a 22 pounder. And no, those aren't gunshot wounds -- Dave said the 47 pounder had to be harpooned 3 times, because the head wouldn't detach.